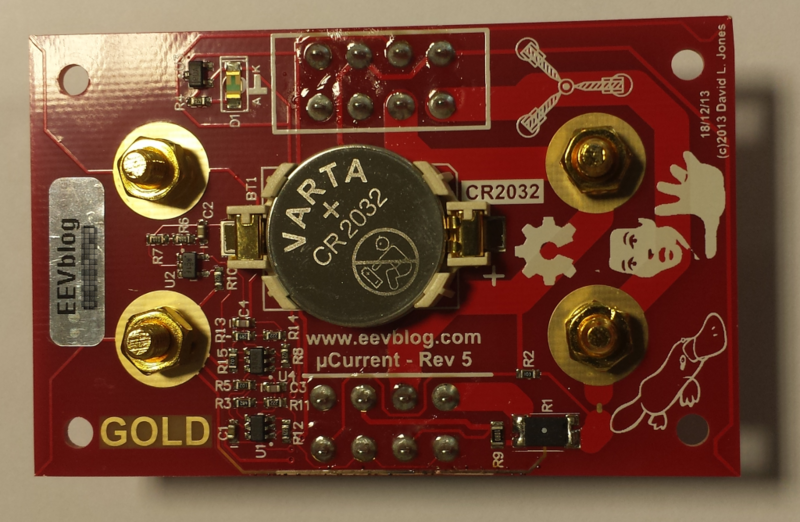 Today my EEVblog uCurrent Gold got fried in an experiment. 😥 The idea was to measure the current of a power supply to a circuit board on a Saleae Logic 8 Pro. So, the current input of the uCurrent was connected in series between the power supply and the circuit board. The output voltage of the uCurrent was connected to an input of the Logic. The supply voltage was measured on a second input of the Logic. Both voltages were measured with respect to the negative side of the power supply. Stupid stupid stupid. The inputs and outputs of the uCurrent Gold are not isolated and both negative binding posts are connected with a tiny trace. Connecting the uCurrent Gold in series with the positive lead to the circuit board caused that tiny trace (along the bottom side of the board in the photograph above) to act as fuse. My bad, but I must say Dave left some room for improvement in revision 6. The uCurrent was recovered with a bypass operation and a big label was installed on the box as reminder of the common negative. The experiment worked a lot better with the uCurrent tinned-Gold connected in series in the negative lead from the circuit board to the power supply. This entry was posted in Electronics on July 28, 2016 by radko.